Now that 1.0 is released, we want to start working on a new website where the community can share their extensions/plugins with other members in the community. Please do your comments/recommendations, also we're looking for volunteers that want to work on this project. Look at example:http://knpbundles.com/ . This is symfony2 bundles. This site has nice explanation of bundles (license, github activity, configuration, etc). P.S. I am not calling for plagiarism. This is just a good example of a site for extensions/plugins. I think that extension/plugin website should be like https://chrome.google.com/webstore/category/home?hl=en . This is the newest design idea. I think that this website should have forum for every plugin, extension. Maybe it should have version of plugin/extension for every version of phalcon. This could help to avoid annoying questions "which version are you using? 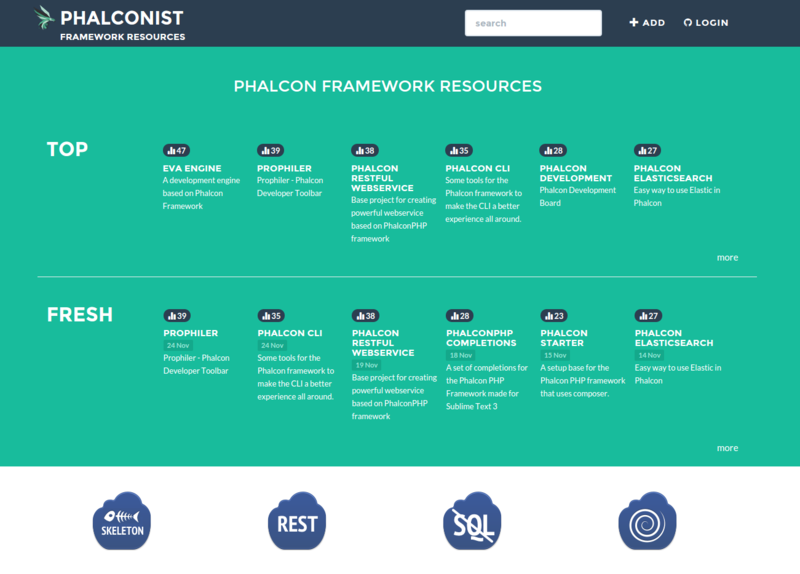 ", simple fork extension and update to current version of Phalcon. @Phalcon, could you give us your vision on extensions / plugins: How do you see them working; what functions they perform and what they offer? Is it front-end stuff like widgets of more like symfony bundles, or zend modules? Use https://packagist.org to promote, Github to store and Composer to install "plugins" (whatever that is). Works just fine keeps the focus on the task at hand. The idea is create a website where users can share their github repositories, those repositories can provide any kind of stuff related to Phalcon: extensions, plugins, bootstraps, components, scripts, etc. together with installation instructions, licenses, etc. Developers can vote the extension/bundle/plugin, add comments, requests modifications, etc. So basically you want to give better visibility to incubator? Have a look at Joomla extensions catalog: http://extensions.joomla.org I don't think people will go that far to contribute something big like galleries, Phalcon is a framework, not CMS.But who knows... For low level components like libraries it is necessary to have versioning, dependencies, compatibility as well as wiki for documentation and maybe change log. The idea itself is not bad, let's keep talking. I want to get involved in this because we are about to create a pretty big project in phalcon so we're making an Email plugin. Is there any way we can help here? about few month ago, is there any update on this project? What happaning with this idea ?